This guide explains how to create a standard rubric. A standard rubric allows you to apply weighted scoring to your feedback. For instance if you have 4 criteria, you could give each one a 25% weighting, or you could choose a different weighting pattern such as 20%, 20%, 20%, 40%. 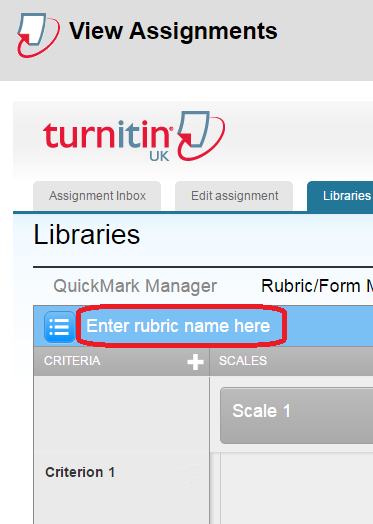 Note that in order to create a new rubric, you will need to have access to at least one Turnitin assignment. This can be on any of your Blackboard courses. Rubrics are attached to your user account rather than to a specific course. 1. Browse to a Blackboard course with a Turnitin assignment on it, and then click on Control Panel –> Turnitin Assignments. 2. Click on one of the Turnitin assignments listed so that you can see the assignment inbox. 4. 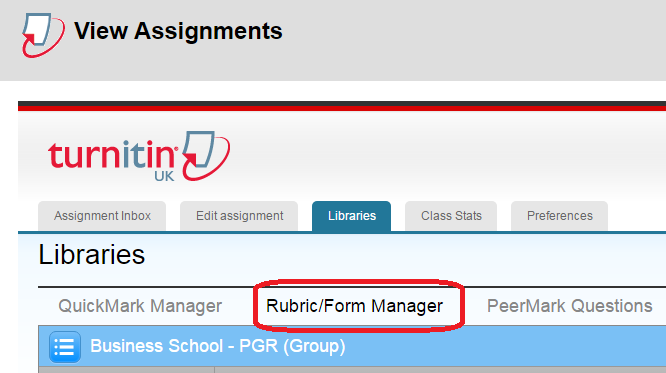 Click on the ‘Rubric / Form Manager’ link. 6. 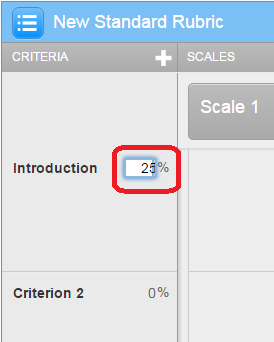 Scroll to the bottom of the blank rubric and select the ‘%’ icon. 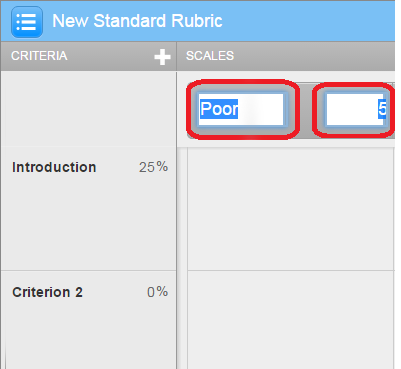 This setting dictates that you wish to create a standard rubric, which allows you to apply weighted scoring to your rubric. 7. 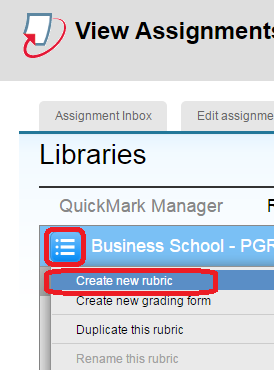 Scroll to the top of the rubric and click on the text ‘Enter rubric name here’. This text will change to a text box. 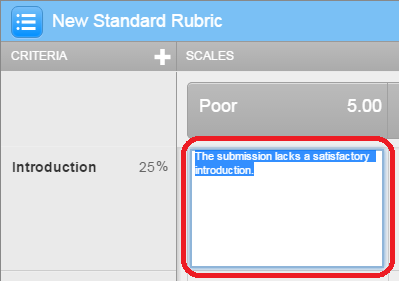 Use the text box to enter the name of your rubric. 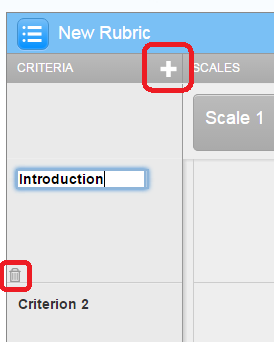 Once you have entered the name of your rubric, scroll to the bottom of the rubric again and click on ‘save’ in the lower right hand corner of your rubric. 8. Edit your criteria titles by clicking on ‘Criterion 1’ and typing the title for your first criteria. Repeat this until you have all the criteria you require. Note that when adding criteria, the title is limited to 13 characters. 9. Note that you can add new criteria using the ‘+’ icon, and delete criteria using the rubbish bin icon. 10. Add the required weighting for each of your criteria by clicking in the field to the right of the criteria name. Make sure that your weightings add up to 100% in total. 10. Edit your scale item titles by clicking on ‘Scale 1’ and typing the title for your first scale item. Repeat this until you have all the scale items you require. You should also edit the scoring for each scale item by clicking on the score field which appears just to the right of the scale item title. 11. Note that you can add additional scale items using the ‘+’ icon, and delete scale items using the rubbish bin icon. 12. 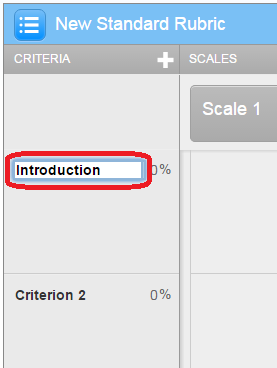 To add a descriptor to your rubric, click in the relevant cell and add the descriptor for the relevant criteria/scale. 13. Once you have entered all of your criteria, scale items, and descriptors, scroll to the bottom of the rubric and click on ‘Save’.